Yes, when it comes to sahar time – there’s nothing more yummier, tasty and appealing than a crispy paratha … but that’s my choice … I’ve known people gulping the Rabrri Dhoodh Fajar Wellay … and some calorie-conscious buddies may suffice upon A Glass of Juice with a toast only … Any variety to add to the list?? 1. Take 1-cup flour, add a little salt to taste and mix it. 3. Take 1 Egg and break it in a bowl. Add a little red chilli powder, black pepper powder, and salt to taste. 4. Add 1 tbsp. coriander leafs and beat until all ingredients are mixed properly. 5. Keep it aside to use it later on. 6. Take a pairha and make like a chapati. 7. Apply few drops of cooking oil on half portion of chapati and fold half chapati on it. 9. Now roll this triangular chapati and make it again of full size. 10. Put Tawwa on a medium flame. 11. When it is sufficiently hot, apply 1 tsp cooking oil on it and spread it. Put the chapati on it and when it is half cooked, turn it upside down. 12. Open paratha’s layer from one place 1-2 inch long with a spoon, take half of the Egg material prepared and pour it inside the chapati with a spoon. 13. Spread Egg material fully inside the chapati immediately. Egg filled inside the paratha will become solid in few seconds. 14. Apply 1 tbsp of cooking oil on the paratha and spread it all around. Turn the paratha upside down. 15. Apply 1 tbsp of cooking oil on this side also and turn it upside down again. 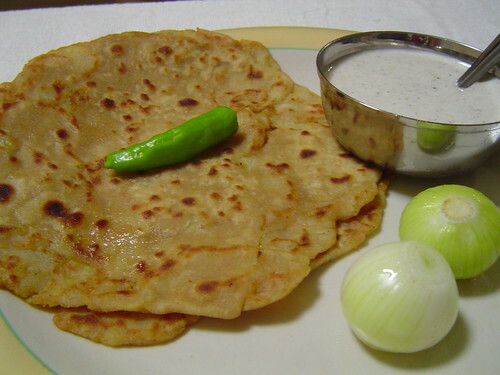 Cook the paratha on both sides until it is fully cooked and become golden brown. Good Recipe!Keep on sending such delightful recipes during Ramzan. 1 tsp. Red Chili Powder ? – Pakistan should stop eating “red” Chili and start making the everyday foods less spicy. Chili was used in early China & India due to extreme poverty. People could not eat for long and use to feel the strong taste to fill them up even with small amount of food. Usually only bread soaked in water (shorba) with red chili was used. Pakistan MashaAllah is a rich nation with a strong kitchen and unlimited varty of foods. We should stop using red chili by slowly reducing it in our diets. However! green & black peppers are fine. A for [pine]Apple: could u pls explain me step 12. how do i open paratha’s layer. since this is the first time i m dealing with roti and paratah. so keep it simple. thanks for sharing quick recipe!!!! Yaarr Lehta hay shadi kerni he peray gee..